Some commentators say the world is flat, but a map of innovation suggests otherwise. 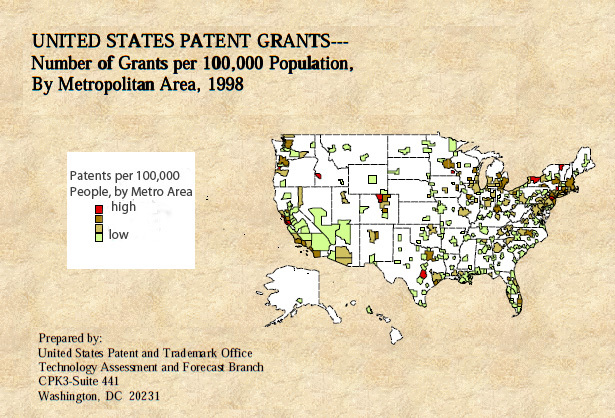 Patent registrations come from a select group of highly innovative places. Leading the pack in the United States is the San Jose-Sunnyvale-Santa Clara, California metropolitan area–Silicon Valley. In Silicon Valley, a culture of innovation, infrastructure such as research universities and venture capitalists, and a talented workforce from around the world produces almost as many patents as the entire metropolitan areas of New York City and Los Angeles combined. The Minneapolis-St. Paul metropolitan region is in eighth place on the list of patents granted between 2006 and 2010, just behind Seattle and Chicago. A recent NPR news story highlights the importance of cities, infrastructure, and connections to the geography of innovation. Urban scholars such as Jane Jacobs, Richard Florida, and Edward Glaeser have long argued that cities are essential to innovation because they provide the dense clustering of talented people for the efficient exchange of ideas. Going back further, English economist Alfred Marshall wrote in his 1890 Principles of Economics that in industrial districts there was a geographic clustering of knowledge such that “..the mysteries of industry become no mysteries; but are as it were in the air.” The most recent data on the geographic breakdown of patent registrations is found here.